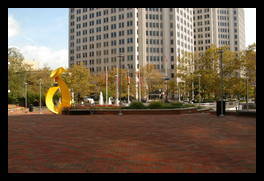 This large plaza is directly above the metro station and bus terminal. 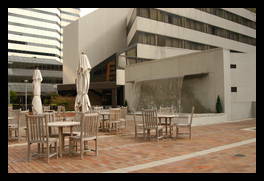 It is a brick plaza with four fountains, planters with trees and flowers, and tables and chairs. The main entrance to the plaza has a large fountain with 6 jets of water shooting up. The back of the fountain cascades down to the bus stops. 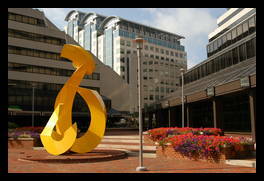 There is also a large, yellow, abstract sculpture. That may be all that most people see, but if you go back further you will find planters full of flowers. 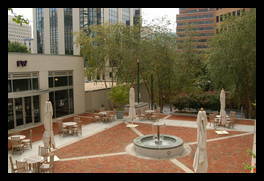 The walls of the planters are brick and stone, and are at the right height to sit on. There are also benches in this area. 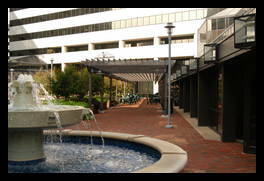 Behind another fountain is a pergola with tables and chairs under it. 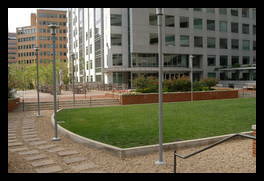 There is also a small sunken grassy area. Across the grass is another section of the plaza. This part has a number of tables and chairs, as well as some umbrellas to keep the sun off. 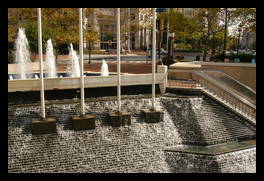 There is a large fountain that is a solid sheet of water, about 15 feet wide. Down a set of stairs is yet another part of the plaza. This area has more tables, chairs, and umbrellas, as well as another small plaza. After this is a stair case that opens on to Montgomery Lane. Shade yes ok Some of the tables have umbrellas, other than that it is just shadows cast by the buildings.